Now University of British Columbia (UBC) research might have pinpointed some of the genetic machinery responsible for the plumage colouration in Audubon's and myrtle warblers, related but distinctly feathered North American songbirds. 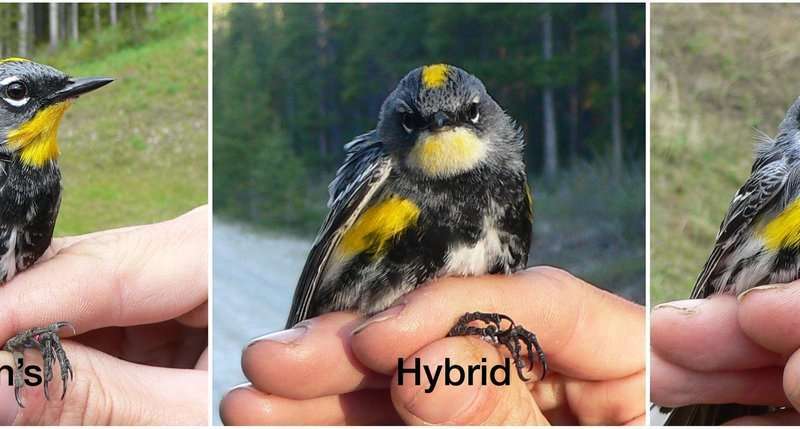 "Audubon's and myrtle warblers interbreed in a narrow band across British Columbia and Alberta," says David Toews, co-author of a new Proceedings of the Royal Society paper exploring the birds' colouration. "Those hybrid warblers, while considered oddities to some birders, were key for this study because their plumage traits and genes are all jumbled and mixed, allowing us to link their differing colours to genetic markers and hopefully the genes responsible." Both types of warblers use colourful carotenoid pigments to make several yellow feather patches, including their yellow-rumps—the birds are colloquially referred to as 'butter butts'. But only Audubon's also used carotenoids in their telltale yellow throats. Myrtles have white throats and the hybrids have a mix of white and yellow. "We found strong associations with several genomic regions across a handful of distinct plumage traits" explains co-author Alan Brelsford. "Now we can now dig even deeper into these regions to understand the mechanisms that make warblers so colourful and diverse." "This study is unusual in that it focused on variation in multiple colour patterning traits," says co-author Darren Irwin, a professor of zoology at UBC. "Two of the plumage differences between the species, eye spot and eye line colouration, appear to be encoded by a single region in the genome."